白迪, 刘海舟, 蔡全信, 袁志明, 张经常, 陈贵红, 金玉华, 陈燕芳, 梁邦新, 宋光超, 闫建平. 苏云金芽孢杆菌以色列亚种水剂对新疆额尔齐斯河下游地区蚋的控制研究[J]. 中国媒介生物学及控制杂志, 2018, 29(3): 231-234. BAI Di, LIU Hai-zhou, CAI Quan-xin, YUAN Zhi-ming, ZHANG Jing-chang, CHEN Gui-hong, JIN Yu-hua, CHEN Yan-fang, LIANG Bang-xin, SONG Guang-chao, YAN Jian-ping. Study on blackfly control by Bacillus thuringiensis subsp. israelensis aqueous suspension in the lower reaches of Irtysh River in Xinjiang Uygur Autonomous Region, China[J]. Chin J Vector Biol & Control, 2018, 29(3): 231-234. Corresponding author: YAN Jian-ping, Email: jpyan@wh.iov.cn. Abstract: Objective Application of aqueous suspension of Bacillus thuringiensis subsp. israelensis (Bti)on the control of blackfly in the lower reaches of Irtysh River in Xinjiang Uygur Autonomous Region. Methods The pesticidal activity of Bti on blackfly larvae was tested through bioassay and field experiments, respectively. The LC50 and LC90 were computed by the Probit regression analysis method in the SPSS 19.0 software. Results The Bti aqueous suspension is an effective pesticide for blackfly control. The bioassay result suggested the LC50 was 0.034×10-6 g/ml and the LC90 was 0.118×10-6 g/ml. In field tests, the control efficacy of blackfly larvae was more than 83.21% in 12 h and more than 97.07% in 24 h. From 2013 to 2015, the adult population density of blackfly in the continuous application area decreased by 89.43%. Conclusion Bti aqueous suspension is an effective pesticide to control blackfly larvae, which is efficient for the prevention and control of adult blackfly in the lower reaches of the Irtysh River in Xinjiang Uygur Autonomous Region. 陈汉彬. 中国蚋类区系分布和地理区划(双翅目:蚋科)[J]. 动物分类学报, 2002, 27(3): 624-630. 马合木提, 安继尧. 中国新疆蚋科名录(双翅目:蚋科)[J]. 中国媒介生物学及控制杂志, 2016, 27(2): 176-178. 张桂林, 刘斌, 韩增宪, 等. 新疆额尔齐斯河下游北湾地区蚊虫季节消长观察[J]. 中国媒介生物学及控制杂志, 2007, 18(1): 12-14. 金玉华, 张经常, 闫建平, 等. 新疆北屯地区蚊虫种群动态变化及综合防控[J]. 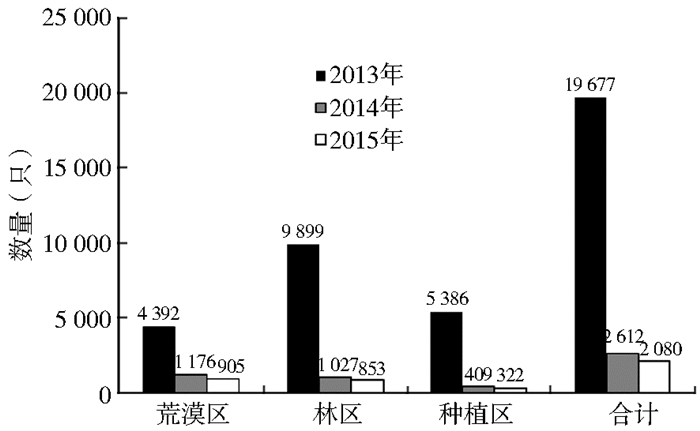 中国媒介生物学及控制杂志, 2014, 25(4): 347-349. 张桂林, 刘斌, 韩增宪. 蚊蚋对新疆某边防部队官兵健康危害的调查[J]. 中华卫生杀虫药械, 2006, 12(3): 185-186. Walsh JF. Evidence of reduced susceptibility to DDT in controlling Simulium damnosum(Diptera:Simuliidae)on the River Niger[J]. Bull World Health Organ, 1970, 43(2): 316-318. Myburgh E, Nevill EM. Review of blackfly(Diptera:Simuliidae) control in South Africa[J]. Onderstepoort J Vet Res, 2003, 70(4): 307-316. Stephens MS, Overmyer JP, Gray EW, et al. Effects of algae on the efficacy of Bacillus thuringiensis var. israelensis against larval black flies[J]. J Am Mosq Control Assoc, 2004, 20(2): 171-175. 李春晓, 董言德, 丁玉来, 等. 遥控飞行喷雾器喷洒高效氟氯氰菊酯防治黑瞎子岛蚊虫和蚋的现场效果研究[J]. 中华卫生杀虫药械, 2015, 21(2): 128-130.